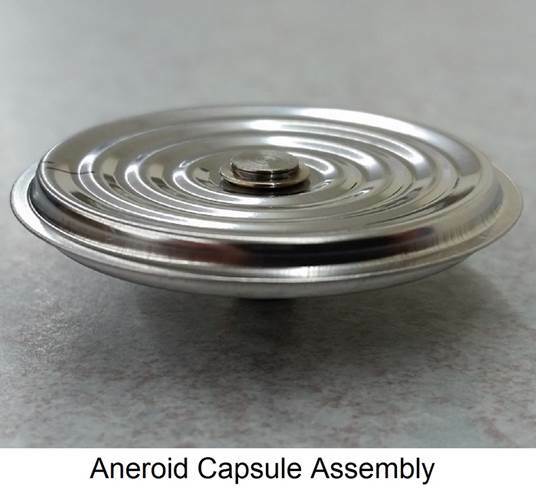 The aneroid capsule assembly has a deep vacuum trapped inside, and measures the difference between the atmosphere outside of the assembly and this nearly perfect vacuum. The internal vacuum is constant and provides the reference pressure that the capsule uses to measure altitude. Note the collapsed condition of the altitude capsule compared to the airspeed capsule. The atmospheric pressure is pressing on the assembly which has an internal vacuum. Increasing altitude up to the near vacuum at 40,000 feet, the capsule will expand to nearly the same profile as the airspeed assembly. 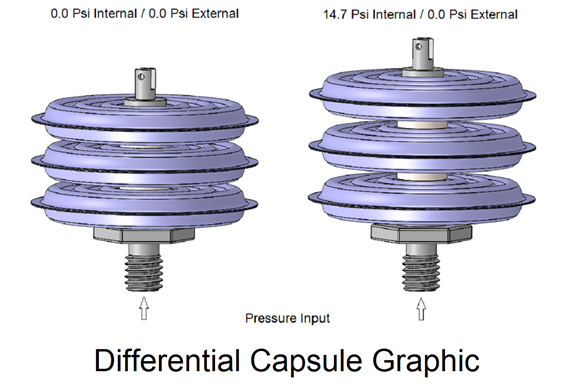 Both capsules measure a differential pressure and are neutral when the difference is at or near zero. For the aneroid, this occurs when exposed to a vacuum, and for the airspeed, this occurs when the inside and the outside pressure are equal. 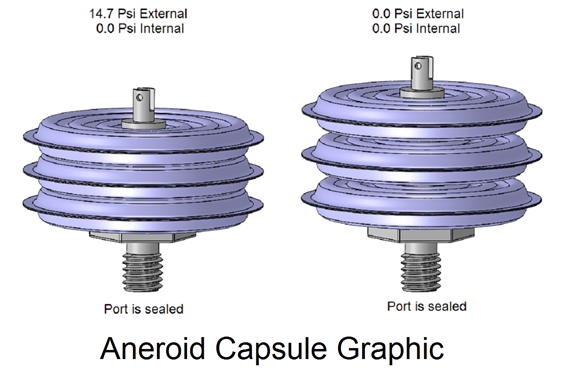 The aneroid capsule is used in measurement of the aircraft altitude, and for the cabin pressure. 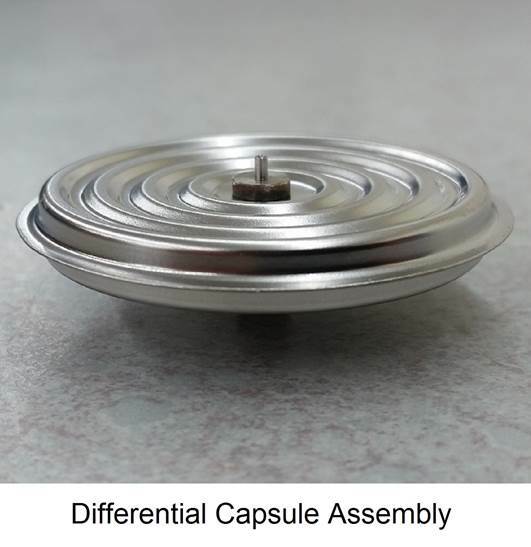 The differential capsule measures the pressure outside the assembly with respect to the inside of the assembly. It operates as an analog computer in that any pressure applied equally to both sides of the capsule will result in zero deflection. In application, an airspeed capsule measures the difference between the impact pressure at the tip of a pitot tube and the static air pressure surrounding the side of the tube. 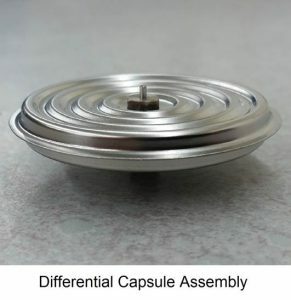 The differential capsule ignores the altitude of the aircraft because this is applied to both sides equally. A stationary aircraft at sea level or in Denver will both have a zero differential. In addition, the higher pressure can be applied both internally and externally for a bi-directional deflection. 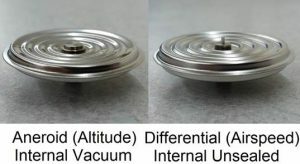 This is how the capsule is used in the Altitude Rate of Change instrument – the applied differential is used for both climb and decent, and the capsule moves in both directions. 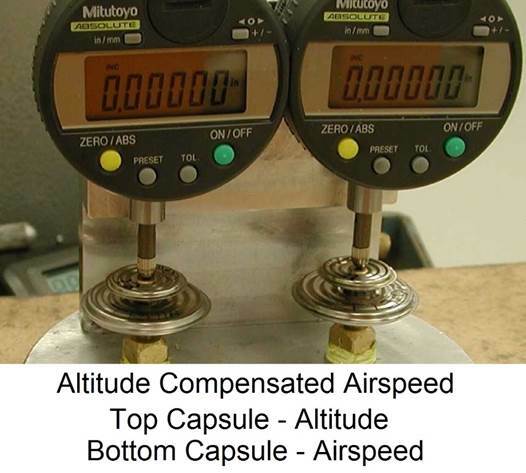 The altitude compensated airspeed capsule is a clever analog computer that provides a pitot static airspeed reading that is corrected for changes in altitude. Assuming that an aircraft was traveling at a constant 350 knots and went from 10,000 feet to 30,000 feet in altitude, the pitot static pressure would drop due to the lower density of the air at the higher altitude. This would cause the differential pressure capsule to collapse. 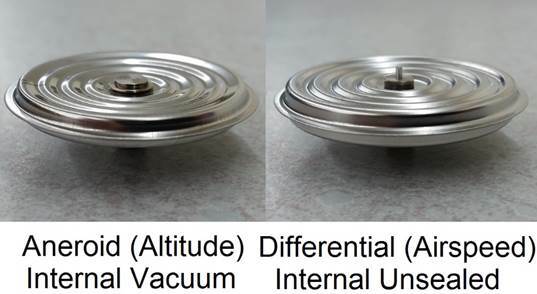 At the same time, the smaller altitude capsule mounted on top of the differential would expand due to the lower pressures at the higher altitude. The altitude and airspeed capsules are approximately matched so that the overall travel is opposed and equal. The primary application for this assembly is in ejection seats. A single switch can be used to trip when the pilot is both below a specific altitude and a specific airspeed. The parachute must not deploy at high speed which would injure the pilot, or at too high an altitude where it would be too cold. This little analog computer is very powerful – it is small and non-electronic.